Cat behavior can be entertaining, perplexing, and sometimes downright annoying, but one thing's for certain: they are always fascinating. 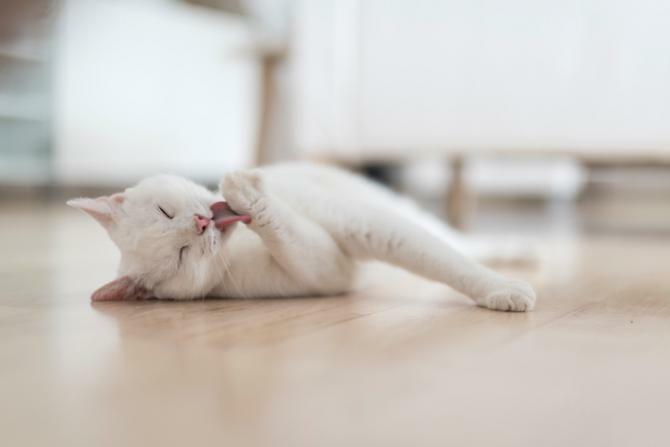 When you take a closer look at each of a cat's typical behaviors, you'll find there's a very good reason behind why your pet does what he does. Cats do a fairly good job communicating with humans and their fellow felines through a series of different meow sounds. Even so, longtime cat owners will tell you that these pets can be difficult to read sometimes. Luckily, you can take away some of the mystery by learning the motivations behind the most common body language and behaviors to understand what your cat is really trying to tell you. Kneading perplexes many cat owners. Cats seem to be softening up a spot to lie down, yet they often don't lie down. Instead, they just continue working their paws as if kneading bread. According to Pet MD, kneading is a behavior cats carry over from kittenhood. When kittens knead their mother's tummy while nursing, it stimulates the flow of milk, which brings the kittens comfort and satisfaction. That's not to say grown cats knead because they are hungry or looking for milk. In weaned cats, it's probably more of a comforting behavior that expresses their contentment. 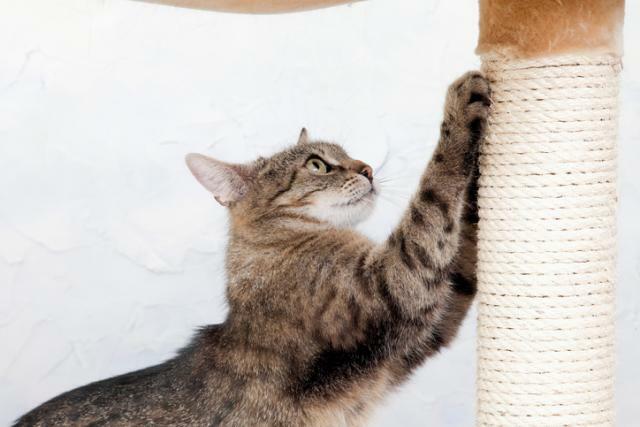 Cats also have scent glands in their paws, so kneading provides a way for them to mark people, areas and items in order to stake a claim on them. Cats have scent glands in their faces, and they like to rub them on objects to mark them with their scent. According to VetStreet.com, this is a territory-claiming behavior, and cats will mark just about anything, including people, to claim them as their property. Scratching helps shed the outer layers of their nails to keep them fresh and sharp. As they scratch, they also mark their territory via the scent glands in their paws. They also like to dig their nails into a surface in order to have a good stretch. When a cat waves or swishes his tail back and forth, he is saying that he wants to be left alone. Bother your pet at this point, and you may get scratched. When the tail is help straight up, the cat is usually in a playful mood. When relaxed, the cat's tail is usually held downward. 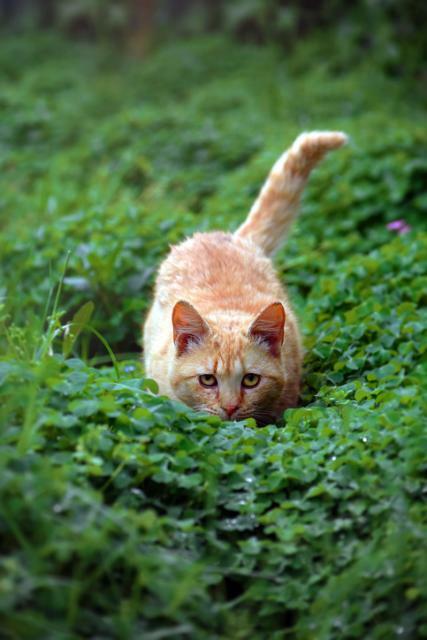 The Humane Society also notes that crouching is part of stalking behavior, and it usually means your cat is getting ready to pounce. In the wild, the cat would be preparing to pounce on prey, and domestic cats may well do this in the garden when hunting birds or small animals. It is also very normal to see cats do this in the house. They will get ready to pounce on their fellow cats, other pets in the home, or even a human leg if nothing else of interest presents itself. According to Animal Planet at Pet Assure, a cat will stretch out and expose his underside. This puts the cat in a very vulnerable position, so you know that he really feels truly safe and secure when he lies like that. In a different situation, rolling onto his back may indicate that your cat feels threatened. Cats sometimes roll onto their sides when fighting because this position frees up all four of their paws for scratching. If your cat's holding his paws out with claws extended, he's ready to scratch anyone who comes near him. In yet another situation, one cat may give in to another cat and lay down in order to signal that he submits and doesn't want to fight or play anymore. According to Certified Animal Behavior Consultant Amy Shojai, cats communicate through different ear positions. Ears held forward indicate the cat is curious and alert to noise. Sideways or "airplane ears" mean a cat may feel threatened or uneasy. Ears facing sideways mean indicate that a cat is experiencing increasing agitation if it continues, he may attack. Ears that are flattened and/or twitching usually mean the cat is extremely scared or agitated and may be ready to fight. Howling, which generally indicates some form of distress. It could be due to fear, loneliness, anxiety, or related to pain, medical conditions, or old age. Another form of howling is called "caterwauling" and female cats in heat make this sound to attract mates. Growling occurs if the cat is nervous, afraid, or aggressive. Hissing is related to fear and defensiveness; cats make this sound when they feel threatened. Chatter is a noise related to excitement and predation. 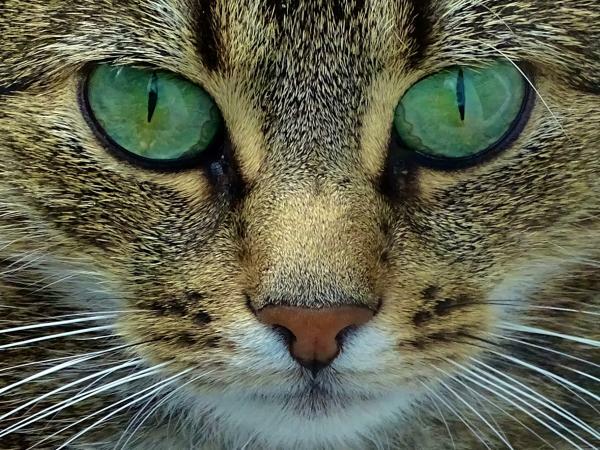 It's likely to be heard if your cat is focusing on a bird or small animal. Screaming can be heard by cats who are fighting, or also during the mating process. Every cat is different regarding their regular vocalizations. Some breeds, such as Siamese, are known to be more "talkative" than others. If your notice a sudden change in your cat's frequency or intensity of vocalization, this may indicate a medical or behavioral problem and a trip to the veterinarian is warranted. Now you know the motivation behind many common feline behaviors. There are likely other peculiarities you'd still like to understand about your furry friend, but you probably never will. That's just part of the adventure of sharing your life with a cat. Accept it and enjoy!